Although demographic change has been a widely discussed topic for decades, its scope, social impact and related policy responses leave us with many unresolved social issues. Demographic change is a reality for all European societies but the ways in which it is taking place differ from country to country. Active ageing both as a concept and policy response to the demographic ageing of populations has been widely debated, researched and utilised, informing both policy and practice, and providing a common narrative framework to ageing. However, there continues to be a lack of clarity around the precise meaning of ‘active ageing’. 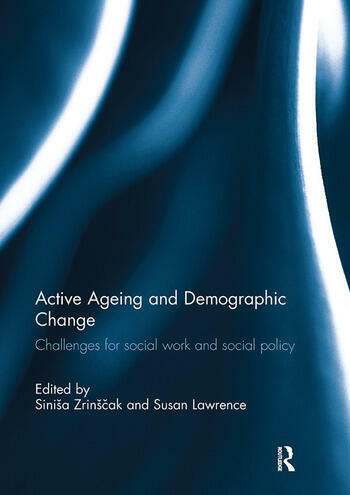 This book explores the way in which social work is critically engaging with the theme of active ageing, in light of, or maybe as a reaction to, the policy responses witnessed within the context of large-scale and rapid demographic change. This book was originally published as a special issue of the European Journal of Social Work. Siniša Zrinšcak is Professor of Sociology and Social Policy in the Faculty of Law, University of Zagreb, Croatia. He was previously Head of the Department of Social Work of the Faculty of Law of the University of Zagreb (2007-2011), and Editor-in-Chief of the Croatian Journal of Social Policy (2002-2009). Susan Lawrence is President of the European Association of Schools of Social Work, Regional Vice President of the International Association of Schools of Social Work, and until 2013 was Head of Social Work at London Metropolitan University, UK. She qualified as a social worker in 1976 and has been a social work academic since 1991.